In the New pack size field enter the The new pack size for the split items (leave this as it is if you're not changing the pack size!). 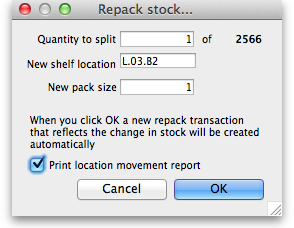 Click OK and you're done - the changes will be immediately visible in the item stock details window. Both of the above at the same time! mSupply provides a feature to produce a 'Movement report' for stock that you have moved to a different location using the split function. 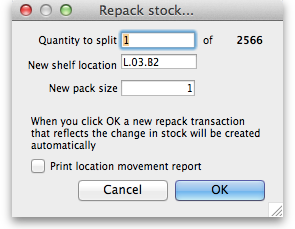 It's useful for printing off and giving to the person who is going to physically move the stock in the store. Note that the original and new locations are clearly identified so a printed version of this report can be easily referred to when physically carrying out the move in the warehouse.